A few years ago when the children left home we scaled down to a new townhome. Having never lived in a townhome community before, and always benefiting from a neighborhood surrounded by long term friends and acquaintances, it was a challenge to make the transition. Our neighbors were experiencing identical scenarios. Since most townhomes do not have front porches or a natural way to interact with your neighbors other than hi and goodbye we felt isolated, especially with family scattered across the country. Gradually, one of the neighbors bravely pulled out a lawn chair into their driveway on a Friday night. Equipped with a glass of wine they welcomed the joggers and walkers and introduced themselves, inviting anyone on the cul- de- sac and street to join them. After a few Fridays passed they accumulated a group of 12 people, sometimes more, sometimes less, who dragged their lawn chairs down the street into the driveway and formed a circle equipped with drinks sometimes and coffee mugs. None of the neighbors joining the circle had very much in common. They did not share similar backgrounds, were from different parts of the country, and had widely varied unique personalities and character traits. It became a potpourri of diverse attributes and temperaments. However, over the many Friday night rituals they came together and discovered each other through bits and pieces of communication, shared problems and joys, not hesitating to assist each other with advice and acts of kindness through difficult times. Somehow these components all worked somewhat seamlessly in the circle. Everyone who wanted to join the circle was welcomed, and texted as a reminder to join the group. It was a creative solution to an otherwise lonely Friday night in front of the TV without the activities of children and absence of friends and families nearby. No one needed to “mask” their identity is was a “come as you are” event, all joiners accepted. Through the years even though the ages ranged from late 20’s (the kids that were still at home out of college and looking for jobs) through the average age of 50’s and a few couples nearing their 80’s) they managed to blend their differences, mannerisms and form a unique bond. It was never boring. The group spontaneously organized random get- togethers at their homes as well, a mini block party, participated in fishing excursions (some seasickness for those who never ventured out in the water), line dancing at the local cowboy club and meetings at the neighborhood pool. These were all casual encounters and all were welcomed. The chairs were occupied by one or more of the 7 personality types being represented. The fascinating thing was that everyone recognized and acknowledged the differences, but accepted each other’s character traits. It is probably one of the best examples of how predicting personality is observational and instinctual to some extent and allows for overlooking peculiarities and the understanding of each other. They would be insulted at being viewed as anything but close friends, but of course this is the perfect focus group to confirm that we can ignore diverse points of view, cherish the differences and establish empathy for each other. What personality types occupied the chairs? Not only were they in widely different professions, but the fascinating part is that their professions matched their personality type. There are a male and 2 female Mercurians. The male Mercurian is highly energentic and employed by the city and enjoys being active in his job, has a quick flash temper but hides it. One female Merurian is high strung, bright but sensitive (do not tell her jokes) and is a competent medical assistant. The other Mercurian female is an insurance negotiator for a hospital. There are several Martians which you would think might be a true clash of horns, but oddly not the case as they have different levels of the Martian character traits and not all the same are dominant. One female Martian is stoic, restrained, resistant to new ideas, very quiet and prefers to internalize her opinions. The Martian male is a very complex individual, though he owns a small company where he works physically, he is intellectually muti-faced. Engineering skills and the mastery of the IT world is second nature to him, He is always first to help anyone with a problem, but does have a temper that he represses. The third Martian is the mother of the little angel and fortunately she is brave, forthright and a fighter which helps her overcome her situation. She is feisty, outspoken and stubborn in her viewpoints which are classic Martian Traits. There is a Saturnian young couple, he is a scientist and she is an HR analyst. They overcame their shyness, are the youngest in the group but have found they like to join occasionally. There is also a Saturnian single woman who works in the pharmacy of a hospital. Added to the mix are two Jupiterian women, one who oversees an HR department of a large corporation who exudes confidence and is social, recently married to a scientific researcher who falls basically into the Saturnian group but has a shy Venusian side to his personality. Another Jupiterian Male owns a large construction company and has a commanding presence. A mix of Saturnian with some Lunarian genes is rare, but the financial analyst in the group seems to most reflect this personality type. And to add laughter, joy and fun are the Venusian couple who have high energy levels, always a smile on their face and a hug for everyone in the circle. There is also a Mecurian /Venusian mix who was a prominent CEO of a Fortune 500 company and numerous other personalities who float in and out of the group because they travel in their jobs. The gathering in the circle is a casual affair, but has established a binding relationship among those who participate. Of course there are disagreements, disappointments and some degree of conflicting opinions, but somehow everyone deals with it in a say that does not impact the relationships or the bond within the group. 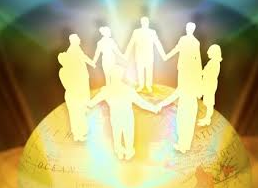 There is an unspoken and deep understanding that among all who sit in the circle that everyone is unique, contributes experiences from their backgrounds and lifestyles not meant to impose on anyone else’s beliefs or points of view. A sense of humor is mandatory and all have learned to overcome and ignore trivial disagreements, momentary pettiness and never hold grudges. When issues arose, the value of the input of the group and the eventual consensus of the best way to overcome neighborhood issues is an invaluable tool. The circle “adopted” as their earthly angel – a blond curly haired little boy who had a very rare birth defect affecting his growth but with a bright mind and big smile who enjoyed interacting with everyone. He became the Apollo personality as he never stopped smiling and enjoying each day. He is outliving his life expectancy by many years and blossomed socially and mentally by being part of this group that loves him dearly, supporting his mom through her very enormously challenging years, as she had previously lost a child a few years prior to this same disease.